She had never discussed her accident or traveling in Europe with him. How could he have possibly known? Their’s was a magical connection from the very first. If you have a story like that to tell, then you too have met your teacher. If you don’t have a story like that, how do you find your teacher? How do you discover which tradition to practice with? One of the Tibetan schools? Zen? Pure Land? Theravada? There are so many choices — 84,000 Dharma doors. For most of us, our journey begins from the time we first learned about the Dharma. It seems pure happenstance, how and when we first learn of something. Of course, some would say it’s no accident — that our opportunities to learn the Dharma are a function of our karma. I’ve written before about my first exposure to Zen at a series of Alan Watts lectures at my college. Those lectures kindled my interest in Buddhism, but didn’t lead to my finding a teacher. At least, not immediately. Think of it as a seed that had been planted, but the conditions were not yet ripe for it to come to fruition. Some of my contemporaries did find teachers. One friend went to Rochester and became a Zen priest under the guidance of Philip Kapleau Roshi. I, on the other hand, had just graduated college, was looking for work, was thinking about a career, was getting married. Running off to Rochester – never mind Katmandu! — was not in my plans. My introduction to practice came years later when Ferris Urbanowski, one of Jon Kabat-Zinn’s MBSR teachers, came to Connecticut to give a talk. I’d seen Jon’s work on a PBS Bill Moyer’s series called The Healing of the Mind and was immediately hooked. Watching the filmed images of Jon teaching meditation to chronic pain patients awakened the seed planted years earlier by Alan Watts. As a psychologist, I’d treated chronic pain patients with biofeedback and hypnosis with limited success. I was intrigued by the possibility of using meditation to ease their suffering. When I attended Ferris’s workshop, I thought I was acquiring a skill to help my patients. 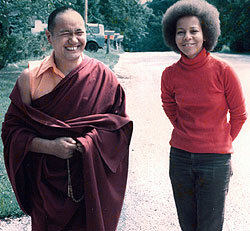 Instead, as I meditated for the first time under her guidance, I discovered something of vital importance for myself. At the end of the workshop I asked Ferris if I could train at the Center for Mindfulness. She told me I’d first need to cultivate my own meditation practice and then complete at least one ten-day retreat before applying. I began sitting daily, did my first ten-day retreat at IMS with Ruth Denison, and did my internship at the Center for Mindfulness. I was off and running. Ferris, Jon and Ruth were fabulous first teachers, but neither Ferris nor Jon billed themselves as Buddhist teachers, and Ruth, who was authorized to teach, was on the other side of the continent. I began searching for local teachers I could learn more from. I attended the Buddhism in America conference in Boston in 1997 where I heard Dharma talks from a variety of teachers from different traditions. Two of them “clicked” for me: Larry Rosenberg and Toni Packer. I then went on a number of retreats with both of them and am deeply grateful for what I learned. What made Larry and Toni “right” for me? For one thing, they didn’t have inflated egos. They didn’t call themselves “Enlightened.” They didn’t surround themselves with admirers. They didn’t project themselves as charismatic leaders. They didn’t ask for submission, obedience, agreement, or belief. The first thing I felt with both of them was “safe.” I didn’t have to surrender my intelligence or my independence. For better or worse, that’s what I needed. You might argue that I overvalue intellect and independence — that these are attachments I need to work on — but I could never have gotten started by surrendering them. Finally, as I spent more time observing Larry and Toni I could see that they were trustworthy and that they embodied the Dharma in their own lives. Who they were was consistent with how they presented themselves and what they were teaching. To summarize, I started with them because they were 1) nearby, 2) non-threatening, 3) trustworthy, and 4) allowed me to absorb the Dharma with my analytical-empirical approach to things 5) without surrendering my independence. That’s what I needed to start out. As I’ve continued my journey I’ve met many wonderful teachers. It may be that as I go on in the Dharma I may need teachers who offer something different — something more challenging — something less compatible with my natural approach to the world and my view of myself. We’ll see. Over the years I’ve been exposed to a variety of traditions. I started out in the Insight Meditation tradition, which has sometimes been described as Theravada practice with a Mahayana frame. I’ve practiced with non-teacher Toni Packer in her non-tradition. I’ve received pointing-out instructions for Dzogchen practice from a Tibetan lama. I currently practice with Zen’s White Plum Asanga tradition. All of these traditions stress the cultivation of awareness. What brought me to my current practice community? It’s nearby. I like the leadership and the teachers. I like the sangha members. It stresses the practices, values and teachings that are important to me: awareness, compassion, and non-clinging. There isn’t a lot of talk about reincarnation or celestial beings. It’s a congenial practice home. Is it the “right” place for me? Is it the “best” practice for me? Where is the all-knowing Celestial Judge who could possibly answer that question? It’s the one my karma has led me to, and I’ll continue to follow it as long as it continues to be of benefit. Or until my karma brings me to the teacher who makes my hair stand on end. Here’s my advice on how to find a tradition and a teacher. Try a few out. See what’s a good fit — a place where you can practice with sincerity and without giving up what you value in yourself. See if you seem to be benefiting. See if the teacher is genuinely there to benefit others and isn’t simply on an ego-trip. There isn’t one true school of Buddhism. There are 84,000 Dharma doors. You only need to find one that works for you. When you find one that’s congenial, try sticking with it. Don’t keep looking for the perfect place, the perfect practice — the one that will magically make you enlightened within a year. The perfect place is wherever you happen to be. The perfect practice is your own awareness here and now, and compassion for the people you encounter every day. Thanks to Terry Sherwood for suggesting I write on this topic. Book Review: Buddhist Economics: An Enlightened Approach to the Dismal Science by Clair Brown, Ph.D.
My religion is simple. My religion is kindness.